To those who know little about A.R. "Pete" Gurney, his new play simply pays homage to Katharine Cornell, the onetime "First Lady of the American Stage," and to the greatness of Broadway theater in its heyday. To those more acquainted with him, "The Grand Manner" is also about the prolific Mr. Gurney and his own career. The play, which opened at Lincoln Center Theater on Sunday, reimagines Mr. Gurney's brief encounter in 1948 with the legendary actress. Cornell is in the twilight of her career, starring in Shakespeare's "Antony and Cleopatra" but ruing the demise of grand acting, calling herself "quaint," "popular with grandmothers," and "an antique." Mr. Gurney, the pre-eminent chronicler of America's dying WASP culture, will turn 80 in November, and has felt the same way. Though beloved by many theater-goers, he once told the Buffalo News that he felt like a "medieval stonecutter, hacking away in the dark corner of an abandoned monastery, while everyone else is outside, having fun in the Renaissance." And in 2008, before going on to laud "Buffalo Gal," a New York Times critic couldn't help noting that "the collected works of A.R. Gurney make up what may be the longest goodbye in American theater." But Mr. Gurney puts a little message in a bottle at the end of "The Grand Manner." Though Cornell has mixed emotions about the theater, she says "let's have more of it"; she continued acting for nearly a decade longer. Mr. Gurney isn't exiting the stage either. As he said last week during an interview in his simple, well-worn apartment on New York's Upper West Side (a true WASP, he and his wife really live in Connecticut), he has already completed two more plays: "Office Hours" starts rehearsals at The Flea Theater in September, and "Black Tie" opens next January at Primary Stages' 59E59. Since his first play, "The David Show," was produced in 1968, Mr. Gurney has written more than 50 works, including 42 "full evening" plays, three novels, a libretto and some one-act "curtain-raisers." That tally puts him in the company of Alan Ayckbourn and Neil Simon, with whom he feels a kinship, not a sense of competition. He writes because he's addicted to it, though -- unlike the stereotypical WASP -- never lubricated with alcohol. His drink -- usually a glass of wine, but occasionally a scotch or a vodka -- comes after he finishes for the day. His start was not auspicious. "The David Show" was killed after one performance by a brutal review from Clive Barnes in the New York Times. On the eve of the opening, Mr. Gurney, who was teaching American drama at MIT at the time, had been given a send-off with cake and Almaden wine by his students. After the review, which caused him to get "violently sick," he returned to campus wondering how to face them. Needlessly, as it happened. "They'd brought in another jug of Almaden, and they said, 'stay with it, we're with you,'" Mr. Gurney recalls. Later, he says, "The David Show" won good reviews in The New Yorker and the Daily News. 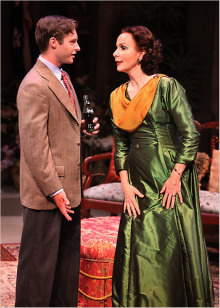 Bobby Steggert and Kate Burton star in "The Grand Manner"
But it wasn't the last time Mr. Gurney faced down reviewers, who tend to chide him for being too genial, too genteel, too traditional, too devoted to WASP-y stereotypes and to his home town of Buffalo, which figures in "The Grand Manner." He feels "the pull" and still returns for visits to family there, though he hasn't really lived upstate since heading off to St. Paul's prep, Williams College, the Navy, the Yale School of Drama and MIT, where he taught for 26 years. "I've been terribly hurt by critics," he says, "and terribly complimented by critics." Yet perhaps because Mr. Gurney believes that "the gods have been good to me," giving him a long marriage, four children and eight grandchildren—"all doing well," he notes—he relates one terribly deflating incident. In 1971, when he won a Drama Desk Award for "Scenes from American Life," he worked hard on his acceptance speech. "I was a little too full of myself," he recalls. Afterward, the critic for The Saturday Review told him that the award wasn't really for him, but rather was meant to shore up the foundering Lincoln Center Repertory Theatre, which had presented his play. "That would be a big low," he says. Some critics, who say he is too old-school, haven't recognized his innovations, either. "In my most prideful moments," Mr. Gurney says, he takes credit for pioneering the use of actors in multiple roles ("The Dining Room" had six actors doing 57 roles) and the use of spare, almost minimalist sets—perhaps most fully realized in "Love Letters," whose two characters sit at a table, reading to each other from letters that cover 50 years. But, Mr. Gurney knows, "critics are part of the game," and when they have a point, he listens to them. They have not changed his outlook, however. "Most of my plays start out with a very serious theme, but in the end they seem to feel like comedies," he explains. "I keep trying to write a tragedy, I do." His own life, which he mines, intervenes. He does not, however, write for laughs, "which can be a terrible trap." Silence in the audience can be equally rewarding, and having audience members achieve self-knowledge by recognizing themselves in a scene or a line -- anagnorisis, Aristotle called it -- is what he is after. Mr. Gurney worries that life nowadays, such as the way people walk down the street talking into their cellphones, jeopardizes the way people relate to one another and bodes ill for theater. Multitaskers don't listen well. Yet "theater is a much more verbal form than cinema or television. It depends on language," he says. "The more we emulate TV and movies with special effects, the more we destroy the basic elements of theater." That is why almost all of Mr. Gurney's plays are presented Off-Broadway, in nonprofit theaters, where the demand for laughs, raunch and razzle-dazzle is lower. Wit can suffice. 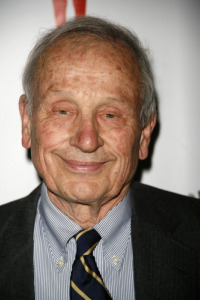 Indeed, Mr. Gurney feels lucky to have started out as a playwright in the '60s and '70s, when groups such as the Circle Repertory Company, the Mark Taper Forum and the Manhattan Theatre Club were supporting a lot of new works and new playwrights. "The encouragement and the facilities were there waiting for us; today the culture isn't there," he says. The days when Williams boys like him would pile into a car, heading for New York to see "Death of a Salesman," are over. "The theater is a rare flower that blooms only occasionally," Mr. Gurney offers, noting that the ancient Greeks and Romans wrote within a limited time period, too. Early on in the interview, he cites a scene from "The Grand Manner" in which his character tells Cornell that she was her best at the very end of "Antony and Cleopatra." Too sly to draw a direct parallel with his output, he hints at it. "The Grand Manner" started out as Mr. Gurney's swan song for his life in the theater, while "Office Hours" did the same for his teaching career and "Black Tie" for his family life. With all three in or near production, Mr. Gurney says he's not writing another play at the moment. But, he confesses, "I am making little notes." They are his prelude to a play.